I love adding color and sparkle to my soap. It’s such a fun and easy way to give my projects lots of personality. Micas are a great way to add both color and shine to a wide variety of projects. They work great in melt and pour soap, bath bombs and more. Unfortunately, some micas do morph in cold process soap. This means that they may change color, or even turn to a dull gray. This can make adding micas to cold process soap tricky. Click here to learn more about micas. Mica painting is a fun technique that allows micas to be incorporated into cold process projects. It even works with micas that morph in cold process soap! 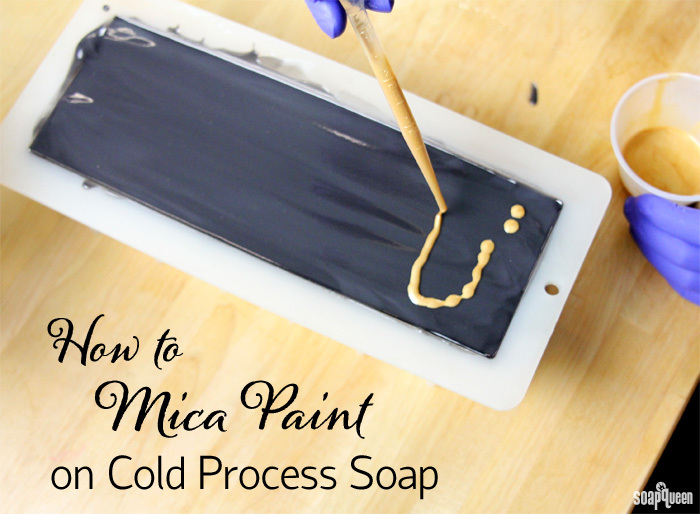 Mica painting refers to adding a mixture of oil and mica to the top of wet cold process soap. This mixture is then swirled in various patterns. As the soap hardens in the mold, the oil is absorbed into the soap and leaves behind beautiful swirls of mica. It usually takes a full day for the oil of the mica mixture to sink back into the soap. Mica painting washes off once introduced to water. See the photo below for some fun mica painting examples! To prepare micas for mica painting, they first need to be dispersed in a lightweight liquid oil. I like to use sweet almond oil or sunflower oil. Other good oil options include avocado oil, canola oil or chia seed oil. Disperse 1 teaspoon mica into 1 tablespoon of oil. Then, use a mini mixer to help get rid of any clumps. If you’d like the mixture to be highly pigmented, you can add up to 2 teaspoons of mica per tablespoon oil. If much more mica is added, the mixture is more likely to be thick and may not swirl as well. If more oil is added, the oil may not soak back into the soap, leaving behind an oily top. When you are finished adding your mica to the top of the soap, spray very lightly with 99% isopropyl alcohol. Spraying too much can disrupt the swirl and cause the mica paint to expand and spread. To apply the mica to the soap, I like to use droppers. This allows me to drop lines of mica (shown above) or small drops. Another thing to keep in mind is the texture of the cold process. If the soap is too thick it will not allow for fluid and smooth swirling. I recommend a thin to medium trace for mica swirls. Read more about trace here. 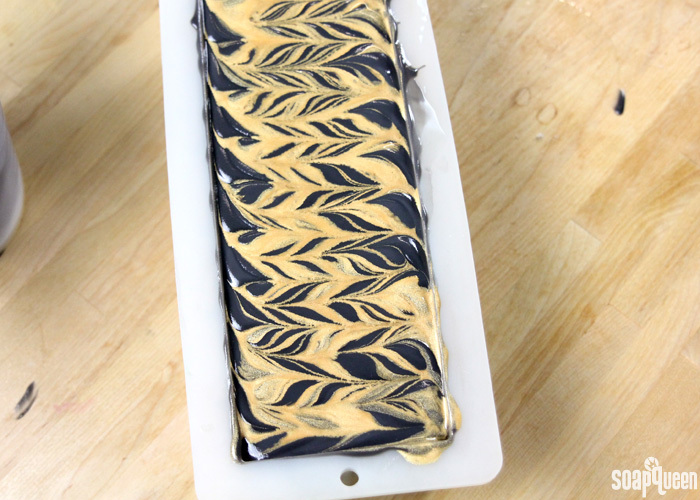 This beautiful gold mica swirl is demonstrated in the Black, White and Gold All Over Cold Process Soap. I love the way that the sparkly gold mica looks against the rich black cold process top. 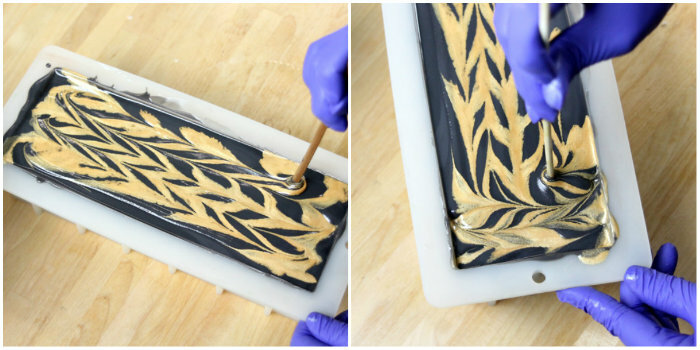 Mica painting is a great way to add some glam to an otherwise basic soap. This project uses the mica painting as you would soap batter to create thick lines of swirls. If you like the look of small swirls of mica rather than the thick lines, place dots of the mica/oil mixture to the top. Then, use a skewer to swirl the dots in random directions. To see this in action, check out the Bramble Berry Instagram video below! 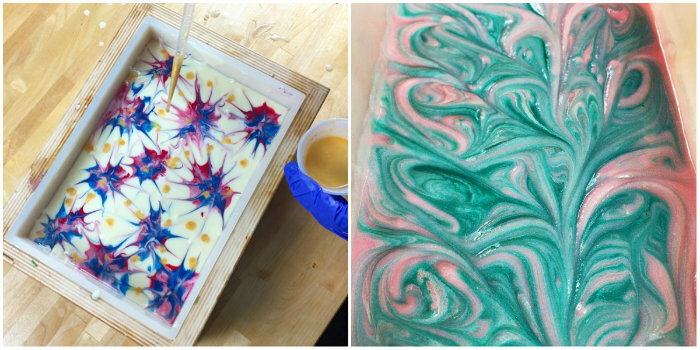 This process is demonstrated in the beautiful Vibrant Mehndi Cold Process Soap shown below, and the 4th of July Fireworks Cold Process Soap. In the Instagram video below, you can see the mica painting in action. Drops of various dispersed micas were placed on the top of black cold process soap. Then, using a chopstick they were swirled in various directions. As they swirl, the various colors mix together slightly, creating a beautiful multi-colored effect. Have you ever tried mica painting before? I love to use micas that usually morph in cold process soap on the top for sparkle and shine. It’s also super fun to do! 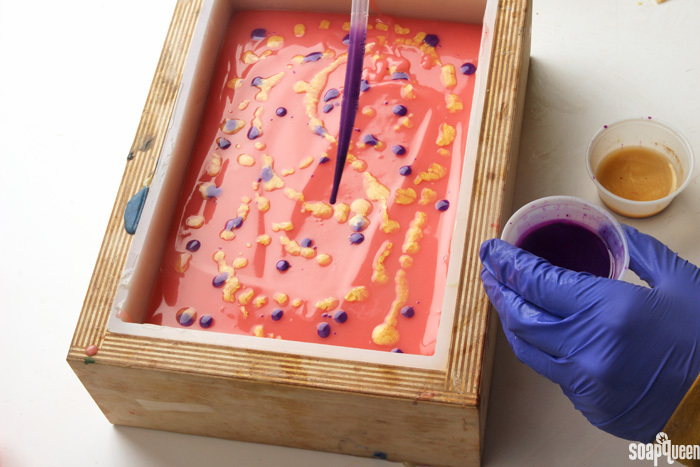 I know this might be a silly question but is it possible to use Alcohol Ink to add color to cold process soap as a colorant? I have been searching the internet but haven’t found anything either way. I had a problem with the top of my soap remaining sticky after Mica painting, even after my soap was totally cured. I dispersed 1 teaspoon of Mica to 1 tablespoon of Sweet Almond oil. I sprayed the top of my soap with 99% alcohol. Can the alcohol cause stickiness? I missed this question, sorry about that Debbie. 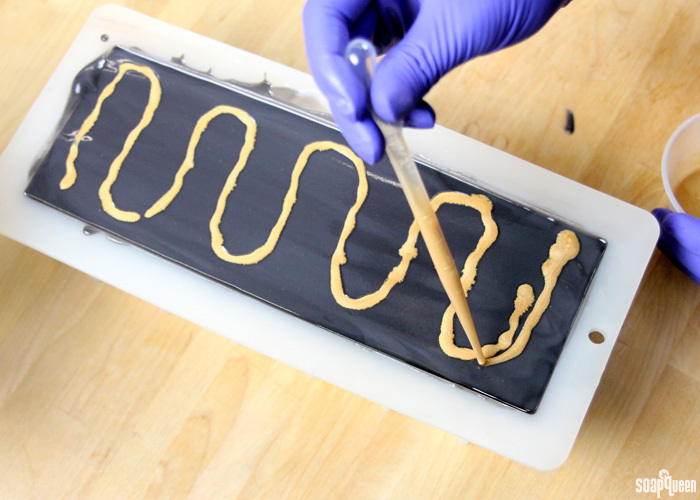 The oil is usually absorbed into the soap so it shouldn’t feel too sticky. Does the soap still feel that way? Ok just to be clear, this is just mica in oil that is dribbled and then a shallow swirl? I did forget to spritz the alcohol on top once finished. Would that have caused the discoloration? We have made several cold process soap loaves with Shamrock Green on top, and have had some inconsistent results. Sometimes it turns out a nice green, other times it morphs or fades. I believe that is because the color bleeds, and as it bleeds into the soap it reacts with it and morphs. We don’t recommend it for cold process soap. I’m sorry about that Venez. Can this technique also be used to create mica veins? I know you use a powder duster for this but I always create such a mess that way. I guess it would only work with a flat surface of soap since the liquid will created pools in the lower parts when having a textured top. And there is no risk of layer separation. Also, if you’re worried about making a mess with the powder, one of our customers gave us a great tip. She recommends using a straw or dropper to gently distribute the powder. That makes it a little less messy, and means less colorant on you! Thanks for the advice. I will keep these things in mind. I like to try new things and will give it a try. I tried the droppers today for the mica veins but like the powder duster more for the bigger surfaces. The droppers work nice in the corners. Also, I did some mica paint with plastic molds today. I think you do this after unmolding. I have a 3D triquerta and a pumpkin mold and painted the shape prior to adding the soap. The mica stayed nicely in place when pouring. Also, the customer recommends using the powder duster to drop the powder, then the straw or the droppers to distribute it. That way you’re not blowing on the color, which can cause a mess. Sorry for any confusion! I unmolded my plastic molds yesterday. I used sunflower oil and your mica paint technique for my pumpkin mold and the pumpkins (painted in gold) and leaves (painted in green) came out so nice…. As long as you apply a thin layer this works very nice and can give you a very detailed picture. I am wanting to paint some small M&P soap portions, let the paint “dry” then pour into a clear M&P bar. Will the Mica paint bleed into the heated clear M&P? If it would, do you have any suggestions onto what colorants would not bleed? This sounds like a fun project! To get the look of mica being “sprayed on” the top of your soap, there are a few options. 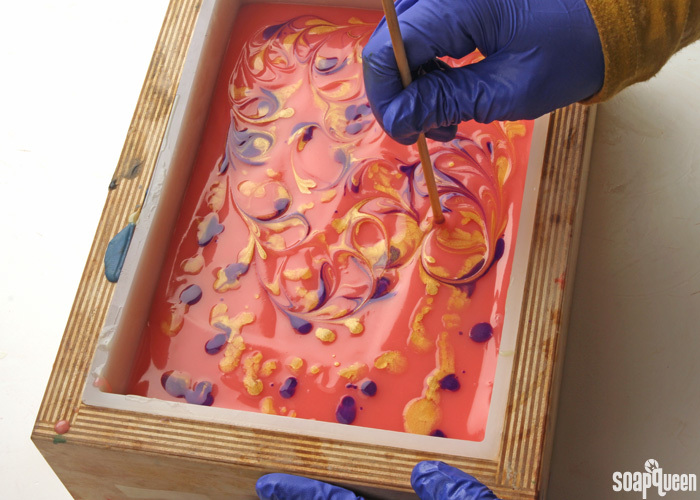 One option is to use a powder duster to apply a thin layer of mica across the top of the soap while still wet. The mica will adhere to the wet soap, and looks gorgeous. The mica can transfer to fingers when handled, and will wash off quickly when wet. You can see this technique in the tutorials below! You can also apply mica to small areas of solid soap using a brush, as shown in the video below! Another option (that’s a little less messy) is to mix the mica with a little alcohol, and use a brush to apply the wet “mica paint.” You can see this in the Pumpkin on a Rope Tutorial. will the micas that morph in CP, morph if it’s just painted on? I have a question about additives. So can you add kombucha in soap? It is a fermented tea drink that is carbonated. If so, would you be able to use this up to 100% in your soap recipe instead of water? We haven’t tried using kombucha in soap before! I would recommend making a small test batch to see how it performs. Before using it, I would recommend boiling it or letting it sit for a couple days uncapped to get rid of the carbonation. It may help to freeze or refrigerate the kombucha beforehand as well. There may be natural additives or sugars in the drink that can react with the lye. It can help to pop the soap in the freezer after it’s in the mold too. Does the mica swirl just stay on the surface or do the swirls sink down into the soap so you can see them when you cut it? Thanks!